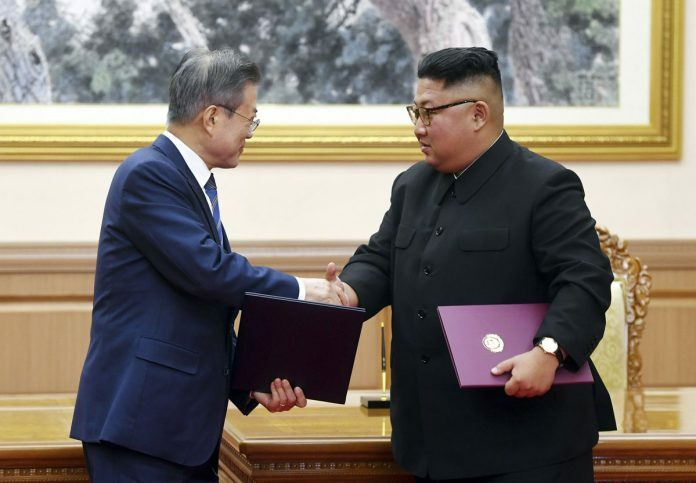 The leaders of North and South Korea announced a wide range of agreements Wednesday which they said were a major step toward peace on the Korean Peninsula. But the premier pledge on denuclearization contained a big condition, with North Korean leader Kim Jong Un stating he’d permanently dismantle his main nuclear complex only if the United States takes unspecified corresponding measures. The question is whether it will be enough for U.S. President Donald Trump to pick up where Moon has left off. Trump told reporters Wednesday that the outcome of the summit was “very good news” and that “we’re making tremendous progress” with North Korea. He didn’t indicate in his brief remarks whether the U.S. would be willing to take further steps to encourage North Korean action on denuclearization.